No. 2, Lot 3794, Jalan Bukit Rimau, Seksyen 32, 40460 Shah Alam, Selangor, Malaysia. Forxcomp Asia Sdn. Bhd. is a Malaysia company and focus on compressed air industry. The operation and organization is full support by mother company -Technical Jetway Sdn. Bhd. - Rental Fleet Management - let us manage all the risk for own the air compressor. - Selling all type of Dryers – Refrigeration, Desiccant, membrane. - Supplying all kind of Pressure Vessel, after-cooler, main line filters, Auto Drain, oil and water separator. - M&E installation for the full compressed air system. - Air Flow measuring system to measure compressor efficiency and production consumption. - Energy Management solution in compressed air system to achieve significant saving on the energy consumption. 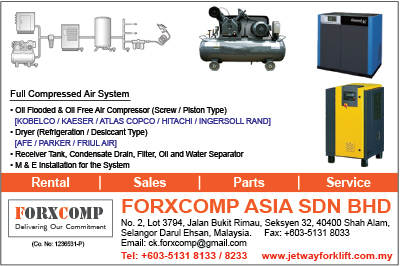 - Service and overhaul for all compressor. improvement to meet your special requirement and specific needs. - Well train and knowledgeable After-Sales support team to meet your service expectation and reduce your production downtime. - More than 15 years on equipment rental experience, will make sure your enjoy hazard free for compressed air system. Our mission is to supply the right product and service to customer that who need us. Achieve and exceed customer satisfaction always our goal for all time.